We have established ourselves as a trusted manufacturer and supplier of Sippers. 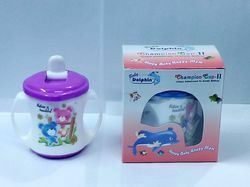 Our range of product comprises Sipper Champion Cup, Sipper A-One Feeding Cup, Baby Mug, Ample Cup, Tip Top Cup, Champion Cup, Sipper Ample Cup, Sipper Baby Cup and Sipper Tip Top Cup. The entire range of products are fabricated by making use of premium quality material under hygienic environment. Moreover, these sippers are available in various vibrant colors in order to attract the attention of every kid. Two In One Sipper Cup are designed in a way that it becomes easy for the kid to hold it comfortably. These sippers are available in various vibrant colors that attract the attention of every kid. The offered range are designed in order to help baby?s development from bottle to normal drinking by using a cup. The entire range of products are very colorful, soft, smooth, easy to handle, cute, adorable and affordable. Our products are made up of non toxic plastics. 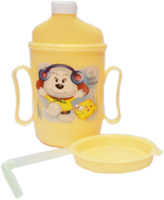 We are one of the leading organizations engaged in providing a wide range of Sipper A-One Feeding Cup. These products are manufactured under hygienic conditions and by utilizing optimum quality material. All these products are designed and developed under the hard and fast compliance with international quality standard. Further, these products are checked on several quality parameters in order to ensure the defect-free nature and better results. 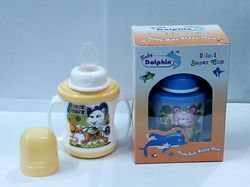 Features: New designed to learn the baby drink easilyTough and durableAttractive foil design. 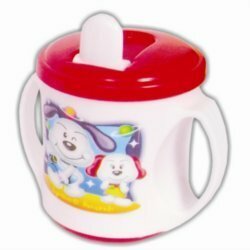 Our domain expertise has enabled us to offer a gamut of Tip Top Sipper Cup. These assortments are made by making use of high grade polycarbonate plastics, which we sourced from reliable vendors of the market. This range comprise two handles that are easy to grip and are appreciated for their odorless character, non toxic nature and tastelessness. Moreover, the offered range are leak-proof and can be used by babies as they make the important transition from bottles to cups. Customers can avail these products in varied designs and colors. Customers can avail from us a wide variety of Sipper Ample Cup. These products are specially designed product with multiple changeable parts. The offered range are designed in order to help baby’s development from bottle to normal drinking by using a cup. The entire range of products are very colorful, soft, smooth, easy to handle, cute, adorable and affordable. Our products are made up of non toxic plastics. We are among the renowned organizations involved in manufacturing and supplying Sipper Champion Cup. These products are widely used to sip the liquid material from the bottle. The offered range are widely demanded among the customers for the capacity to store drinking material and are available in numerous colors, designs, shapes and sizes. Our skilled professionals fabricated these cups using the finest quality plastic material and ensure a flawless collection. We are a client-centric organization engaged in offering a wide range of Sipper Champion Cup II. These products are designed and developed with multiple changeable parts, follow the child's growth. The offered range are made in order to help the baby develop properly from bottle to normal drinking using a cup. Our products are better shaped spout with a cover on top. Also, customers can avail these products in various sizes, designs and patterns as per their requirement. 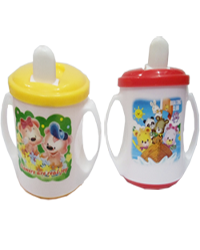 We are among the renowned organizations involved in manufacturing and supplying Baby Sipper Cup. These products are widely used to sip the liquid material from the bottle. The offered range are widely demanded among the customers for the capacity to store drinking material and are available in numerous colors, designs, shapes and sizes. Our skilled professionals fabricated these cups using the finest quality plastic material and ensure a flawless collection. The patented system encourages your child to use a natural drinking action that helps to naturally develop their soft palate and is kind on new teeth. The unique soft silicone spouts and straws are easy to use and easy to clean. 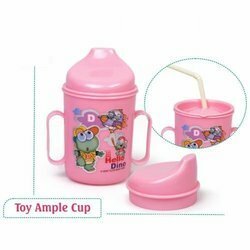 Little Sipper Ample Cups are available in various vibrant colors that attract the attention of every kid. We offer these sippers in different dimensions and at reasonable rates. These sippers are the preferred choice of the clients. With the help of our experts, we are able to offer Champion Sipping Cup II. 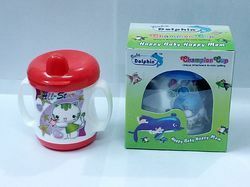 These products are highly suitable for small babies and always keep smile on babies face. Our products are available in different colorful designs and patterns. Moreover, the offered assortment are quality tested on well defined parameters, thereby ensuring their hygiene factor and softness. All our products are non toxic in nature and are safe in usage.